No matter how unusual or powerful your Dungeons & Dragons character is, this complete set of character sheets lets you keep a record of everything that makes your character unique. 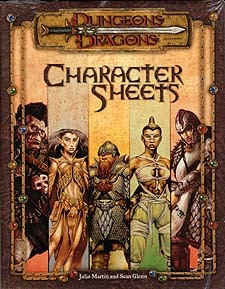 * Eleven double-sided single-class character sheets, one for each of the classes in the D&D Player's Handbook. * A double-sided sheet for multiclass characters. * A sheet for special creatures such as a wizard's or sorcerer's familiar, a paladin's mount, or a druid's animal companion. * Spell planner worksheets and a magic item record sheet. * Easy-to-follow instruction s and a sample filled-out sheet. Every page is designed to be easy to photocopy, so you nmever have to worry about having a fresh sheet handy when you need one.